This is the seventeenth installment in our series, “Trailblazing Genetic Counselors”, in which we highlight genetic counselors who are pioneers in the field. Genetic counselors are health professionals with specialized graduate degrees and experience in the areas of medical genetics and counseling. Genetic counseling is a rapidly growing field offering professionals a wide range of opportunities, which we explore in this series. Learn more on the National Society of Genetic Counselors’ (NSGC) website, aboutgeneticcounselors.com. To keep updated with conversations and news in genetic counseling you can subscribe to our Twitter list featuring the latest updates from over 575 professionals in the field, all in one stream. In this installment, we interviewed Program Directors of newly accredited Genetic Counseling Graduate Programs. Check out our previous two episodes (Part 1 and Part 2) with all the other Genetic Counseling Graduate Programs with new accredited status. What was the motivation to start the program? In Canada, there were only three accredited genetic counselling programs and no program within the Prairies. Each year there were less than 20 Canadian trained graduates entering the workforce with increasing demand for Canadian genetic counsellors in a variety of practice settings. Therefore to assist with recruitment and retention of genetic counsellors across Canada, especially in the underserved Prairie provinces, we sought to establish a program here in Manitoba. This program is a grassroots initiative which engaged genetic counsellors, health care professionals, and basic scientists to be teachers, mentors, and supervisors. What challenges did you/your team face in establishing the program? The process to implement our program was challenging and lengthy. Our program was reviewed at multiple levels within our University, initially through a letter of intent, followed by a detailed proposal, and finally through a site visit by external reviewers. New programs are subsequently required to obtain approval from the Manitoba government prior to implementation, and before undergoing New Program accreditation. Throughout this rigorous process, we were fortunate to have departmental, institutional, regional and provincial support. The feedback we received assisted us in designing a robust curriculum to prepare our graduates for the genetic counselling field. What sets the program apart from other schools? Strengths of our program include its alignment with a centralized clinical genetics program serving a vast catchment area, exposure to cultural isolates, experiences in genetic counsellor-led multidisciplinary clinics, and service opportunities with a new immigrant, Indigenous, rural, remote and inner-city patient population. Our students also have complementary clinical and teaching opportunities with Medical Genetics Residents and other graduate students. Additionally, by participation in province-wide genetic and genomic research and quality initiatives through our thesis-based research program, our students will gain the necessary skills to complete research as a genetic counsellor. Finally, as a new program, there are many opportunities for our students to contribute to the legacy of this program. What institutions are you affiliated with for clinical rotations? All clinical rotations occur within Shared Health Manitoba and the Winnipeg Regional Health Authority Genetics and Metabolism Program, which are accessible within one University Medical complex. Our students also have ancillary experiences with support groups, community education projects, and exposures with non-genetics providers to gain a holistic appreciation for the patient experience. All students arrange an external summer rotation out of province. When do students start their clinical rotations in the program? Our students commence their Early Exposure Rotations in October of their first year. How many students are (or are expected to be) in each class? Three students are enrolled in our program each year. Can you share any words of wisdom for applicants? How can they strengthen their application and prepare themselves for a genetic counseling program? Connect with genetic counsellors or professional organizations like CAGC, NSGC or AGCPD to learn about the field. This could help you identify local or online opportunities to gain the relevant experiences to be a well-rounded applicant with strong academic and communication skills. In your application, it is important to demonstrate how your experiences are applicable to academic, clinical, advocacy and research aspects within this profession. Use your application and subsequent interview to show us why you really want to be a genetic counsellor, above anything else! I was recruited by the Program Director search committee at Baylor College of Medicine (BCM) back in 2015 after Dr. Brendan Lee (the Chair of the Department of Molecular & Human Genetics) made the creation of a Genetic Counseling Training Program a departmental priority in late 2014. The idea of starting a program was first suggested almost 20 years ago, but it was not until Dr. Lee assumed the reigns of the Department that the resources that would be needed were earmarked for developing a program. When I arrived in February 2016, I began in earnest (with the engagement of more than 40 faculty members) to navigate the institutional program approval process. After I arrived in Houston, it took several months to get to know all of the players and stakeholders. A new program approval process was initiated (which had never been utilized before) around the same time I arrived in Houston. As part of the process, I was asked to submit a business plan, a budget, and a strategic vision. Since it involved a new process, we needed to be flexible and responsive as some of the requirements for obtaining program approval were tweaked from time to time during the process. Once we completed the institutional approval, we then obtained the regional accrediting bodies approval and lastly the ACGC approval. Although our timeline for approval wound up working out, we only received ACGC approval less than two months before the NMS deadline for obtaining ACGC New Program Accreditation status. That was a little too close for comfort, but we are grateful that it worked out the way it did (I can elaborate on the timeline of the accreditation approval and when we invited our applicants for interviews which happened over a 12-hour window!). We have 39 genetic counselors that are part of the BCM family and serve as a source of knowledge and expertise which is not readily available to most training programs. In addition, there are over 140 researchers in the Department of Molecular & Human Genetics (DMHG) which has been the recipient of more NIH funding grants on an annual basis than any other center in the U.S. for 7 consecutive years. The DMHG is the largest clinical genetics program in the country seeing over 14,000 – 15,000 patients a year. This includes the patients across the entire continuum of care (ART, prenatal, pediatric, specialty clinics, adult and oncology). We also work in partnership with the Baylor Genetics laboratory whose faculty and staff will be directing our course on variant interpretation and counseling during the student’s second year. (Please See Above) Texas Children’s Hospital is the largest pediatric hospital in the U.S and is a primary affiliated site. It also has the Women’s Pavilion with the Fetal Center and high-risk prenatal patients. We also have rotations at the DeBakey VA Clinic. Our students have already begun observational rotations (within the three weeks of the program’s start). Eight in the first two classes (potentially, nine in the third class). The personal statement and recommendations may be the most important parts of the application since they provide insight into the motivation and commitment of an applicant. An honest and factual representation of the events that have lead the applicant to choose a career as a genetic counselor provide the best evidence of the prospective students’ readiness to complete the rigors of a GC training program. Shadow and/or intern experience is certainly also helpful to successful/qualified applicants. 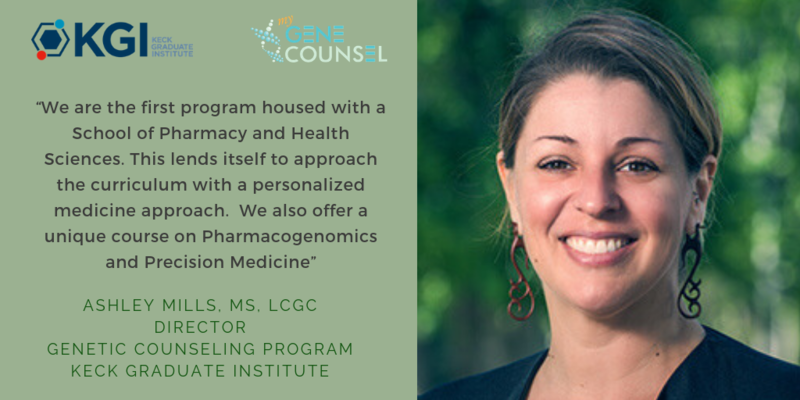 Keck Graduate Institute was interested in starting a Program in Genetic Counseling in order to fulfill the increasing demand for highly qualified genetic professionals. Here is a list of affiliate partners – however, this list is constantly expanding! Students begin introductory fieldwork exposure during Spring of Year 1. This opportunity exposes students to various areas of genetics practice and includes multiple hands-on workshops. Official fieldwork begins the summer between years 1 and 2, with a full-time, 8-week clinical rotation. 13 students to start! We anticipate 13 students in our second cohort and will grow from there! KGI is expected to be a larger program, eventually capping at approximately 25 students per cohort. Diversify your portfolio, education, and experiences! Do your research. Talk to genetic counselors and ask to shadow in the clinic. Know how to advocate for yourself before you can advocate for others. Be passionate about your strengths and interests, and honest about your weaknesses. Love genetics and genomic medicine! Have genuine compassion and the ability to communicate effectively with a vast array of people. Think outside the box. Meet people where they are. Make it happen! In order to be successful in many areas of life, and especially in genetic counseling, one must be a life-long learner! Other traits or abilities that are extremely useful for genetic counseling, and what we look for here at KGI include innovation, empathy, critical thinking, curiosity, self-reflection, tenacity, adaptability, dependability, leadership, and integrity. Don’t forget to check out our other two installments featuring program directors of graduate schools with newly accredited genetic counseling programs (Part 1 and Part 2). Prospective genetic counselors and students, be sure to explore our blog for advice, like our guest blog post from students on the application process, genetic counselors application and interview advice, genetic counseling job interview tips, and more. You can also check out all other episodes of our Trailblazing Genetic Counselors series here. Want to recommend a genetic counselor that deserves the title of Trailblazing Genetic Counselor? Tweet us at @mygenecounsel or email at ellen@mygenecounsel.com!